What man does not desire the big, strong chest of a Greek god? Just imagine all the stares you will get on the beach when you take off your shirt and reveal the chiseled muscles you’ve been working on for so long. And if you haven’t been and you still want to be in great shape for the summer, you have to start doing something about it right now. However, I know that finding time to go to the gym can be hard and that life gets in the way. Often, there is nothing that we can do. But that is not the case here, as there is a simple, easy and fast solution to build your front side from the comfort of your own home. How to Do Dips at Home? How deep should you go on dips? Dips are one of the best exercises for developing a big, strong and attractive chest. Bodybuilders like Arnold Schwarzenegger and Olympic weightlifters like Lu Xiaojun swore by them. They have a place in almost every exercise program ever written – that is how useful they are. They require no equipment you can’t have in any room, making them perfect for a home workout. 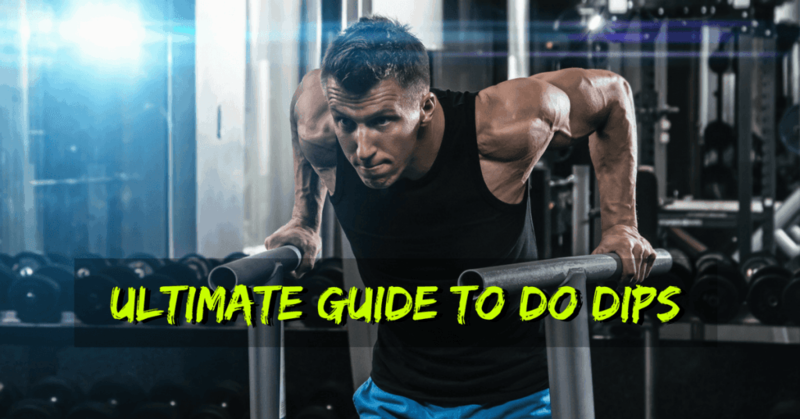 In this article, you will learn everything you need to know about doing dips at home, from the equipment you can use and the proper dip form to the many variations and their specific benefits. A dip station is a cheap, simple piece of equipment you can put anywhere in your house or apartment. A good one will last you a lifetime and they usually aren’t too heavy to be portable (you can find the best portable dip bar here). Before buying or making one yourself think about which exercises you will do on them (some require longer handles, like the Russian dip). A very simple dip set-up anyone can make at home is to use two chairs or similar pieces of furniture. Simply set them up side by side and voila, you have a dip station that is both cheap and convenient. Still, this is not the best solution for obvious reasons. However, in a pinch, like when you are traveling, it works perfectly. If you are creative enough, you can find a place to do dips almost anywhere. A corner on the kitchen counter? Perfect. A table with a curve? It’ll do. All you need is somewhere to put your hands and place for your body to go in between. If you look around your environment, I’m sure you will find many opportunities to do them. If you have an outdoor workout park or a playground with the correct equipment nearby, that is the ultimate place to get in a workout and some sunshine all at once. 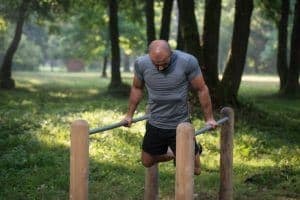 Such parks have become very popular with the rise of calisthenics training in recent years and there is a good chance you can find one in your area. It is also a great place to meet fellow training enthusiasts. Why should you be doing dips at all? Dips are a great exercise that has a lot of benefits no matter what your training goals are. Building the chest, shoulders, and triceps is the primary role of dips, and they play their role well. There is no better exercise that targets those three outside of the primary barbell lifts. Compound exercises like the squat, bench and deadlift make up the bulk of weightlifting programs because they allow us to use the most weight and get stronger faster. The dip is also a compound exercise, which means two things: it uses a lot of muscle groups at the same time and it has a lot of potential for loading more weight over time. Both of those facts combined make it a great muscle-building exercise that you’re going to use for a long time. Want to improve your bench or overhead press? Dips are one of the best assistance exercises to improve your barbell lifts. They strengthen all the pressing muscles you need in those two lifts and are easy to progress with. In fact, you can improve your bench and even the overhead press simply by adding more weight to your dips. Unlike the push-up (which is a great movement and an awesome substitute if you can’t do dips), it is easy to add load to dips by using a weight belt or a weight vest. That is when this exercise really becomes one of the best. With an additional 45 pounds, your muscles will be activated more and will grow much faster. And if you work out at home, grab a backpack and put some heavy books inside. Since this is an exercise where you are in a position capable of producing a lot of power, you can add quite a bit of weight over time. 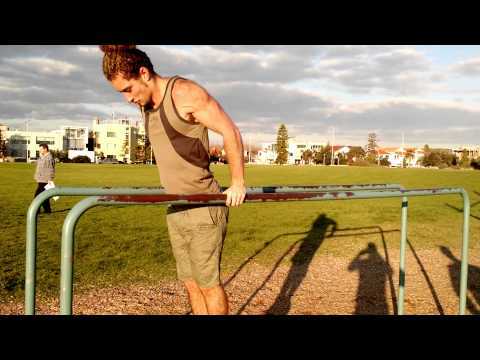 To do a dips with your bodyweight attached to you is a completely reachable long term goal. Here’s Greg from Kinobody.com doing them with 175 lbs. When you master the normal dip, the journey doesn’t end. For one, you can add weight and make the exercise harder that way, but that is only the tip of the iceberg. There are many types of dips, some of which are significantly harder and focus on different areas of the body. We will get more into different variations and their benefits later in the article. Read more about the benefits of having a home gym here. Before we get into advanced territory, we have to make sure that our basics are solid. Correct form is the basis from which you will be able to build muscle and strength. It will enable you to progress faster, both in additional weight and with advanced variations. Start at the top with your arms straight. You should be actively pushing down with your shoulders and continue to do so throughout the movement. This will ensure you will activate your lats, which are an important part of keeping your shoulders safe. To start the dip, make a big chest (puff it up like you were on a beach and a supermodel just walked by) and imagine you are trying to pull yourself down, but an invisible force is actively resisting you. This will activate the proper muscles. Descend slowly for a count of three and, without a pause at the bottom, push with your arms and shoulders simultaneously and return to the starting position. Your forearms should be vertical, both from the front and from the side. 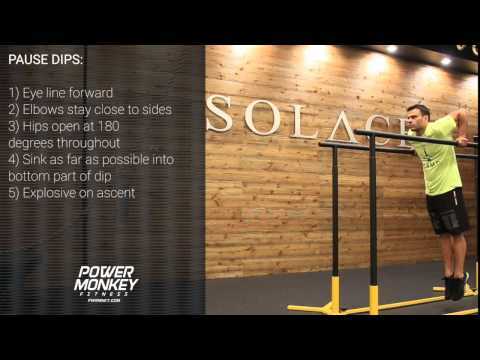 You should be using bars that are approximately shoulder width apart. Keep your head neutral. Don’t raise your chin up when the reps get harder as you could get neck pain. The shoulders should be pressed down (depressed, if you want a medical term) at the top. As you descend down, they will naturally raise up and back a little. You should not be trying to do this consciously: just know that it happens and that it is OK. The first priority when doing dips should be to prevent your shoulders from rolling forward. To understand how this feels, stand up right now and try to do these two things at the same time: try to touch your shoulders together in the front and raise your arms behind you. Your shoulder will roll forward and the position will feel uncomfortable – even without any resistance. This is not a strong position and carries a lot of risk of injury like the impingement. Instead, you should keep your shoulders strong and “packed” during the dip. “Packed” means that they should be pressed down. All of the surrounding muscles should be activated to keep the shoulder in its proper place. With time and experimentation in training, you will be able to feel the difference and find the strongest position for you. When you find it, you will know, as it will feel stronger. Do not add weight or progress to more difficult variations until you find this position. You might be tempted to do so, but resist the urge: it will save you a lot of wasted time and possibly from an injury. That is one of the most often asked questions when it comes to dips and unfortunately, it does not have only one answer. Depending on your goals and body structure, you will want to do it differently. First off, if going around to upper arms parallel to the floor or lower causes you pain, don’t do it. If it doesn’t, the proper depth for general strength and muscle building is parallel or slightly below. Going deeper has some benefits. 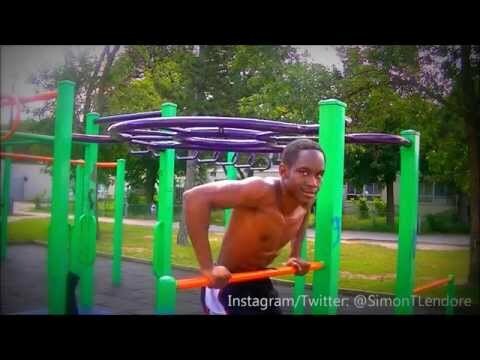 It gives more of stretch on the chest and it is necessary to do if you want to progress to exercises like the ring muscle-up or the Russian dip. However, if those aren’t your goals and you are mainly after strength and hypertrophy, going with the previous recommendation and just adding weight will be more than enough. Even though dips are a fairly basic exercise, they do demand some previous preparation for most people. You should be able to do at least 10 push-ups before training dips. This will ensure that you have the necessary strength for the movement. The push-up is a very similar exercise to the dip, just with less your own weight and therefore easier. Dips fall into the category of behind the back pressing, where your elbows go behind your back (something we are generally not built to do). Most people either have the range of motion to do dips safely or, they can develop it with stretching. A very simple and straightforward way to develop the necessary mobility is to do dips just as deep as you can currently go and increase the range of motion over time as your body adapts. During that time, keep doing push-ups (with added weight if you can) to keep developing your pushing strength. Bench dips are also useful for this purpose. Note: Some people have previous injuries, certain predispositions or a skeletal structure that doesn’t allow for dips. If dips cause you any pain, don’t keep doing them: find another exercise, like push-ups or close-grip bench press. This can be an incomplete range of motion, swinging wildly, kipping, or a number of things that are not included in Proper Form. Don’t do any of them or be shamed forever. You need to get stronger before you return to dips. The best ways to do so are the bench and push-ups. Build up to more weight and more reps and after a while (for example, 3 months), return to the dips and try your strength again. Another way to ease into dips is to use an easier variation. Bench dips are much easier and work the exact same movement pattern. You can also do them for high reps, which will help prepare your body for the stress of the full dip. A great way to incorporate dips if you are almost strong enough to do one is to do negatives. This means that you will start at the top, lower down with a very slow tempo (aim for 10 seconds) and end the movement at the bottom by spotting yourself with your legs. This movement is easier to do because we are always stronger on the eccentric part (the part where we resist gravity or the part where we lower the weight). But since the weight is the same as on the full version, you are getting nearly the same stimulus and after a few weeks, you will be able to do your first rep or two of proper dips. Shoulder pain is a consequence of the wrong form. If you do not keep your shoulders pressed down and back, you will experience pain, sooner or later. Don’t roll your shoulders forwards and don’t shrug them up. If you can do dips at home, a very effective technique to rapidly increase your dip numbers is the Grease the Groove method made popular by Pavel Tsatsouline. The “trick” of this method is to do a lot of easy sets throughout the day. If you can do 2-3 dips, you would do one rep every time you have some extra time. You’ll be surprised at how quickly everyday work like this will improve your form and efficiency. Chest pain during dips is common, but not acceptable. It is caused by the chest tendons not being prepared enough for dips. Stop doing them and go back to push-ups (especially if you haven’t followed my advice and you started doing dips before you could do 10 push-ups! ), build to some solid numbers (5 x 10), preferably with weight and then return to the dips, slowly working them back into your training. One of the best features of dips is that they can be done in a variety of ways to make them harder or to focus on specific body parts. With some slight changes to the form, you can target either the chest or the triceps more when you are doing dips. That doesn’t mean that the other muscle groups aren’t working hard: they are, one is just getting the brunt of the work. A few websites and articles advocate doing dips on the floor as an effective exercise. These people don’t have your best interest in mind, as doing dips on the floor doesn’t allow you to use a full range of motion (in fact, there is almost no movement at all), it puts your shoulders in a bad position and are just ineffective. If you have just the floor to work with, forget about floor dips and do the much more effective push-up. The dip machine is to dips what smith machine squats are to real squats. It may seem like a good idea, but in reality, there are better ways to build up to full dips, like bench dip, negative dips, and building strength either through the bench press or push-ups. There are many useful machines in the gym, but this isn’t one of them. Bench dips are usually done between two benches, with your feet on one and hands on the other. It can also be done with only one bench and your feet on the floor (of course, you can replace the bench in the example with anything else). They are a good stepping stone to full dips but put the shoulder in a more compromised position. This is well and fine when they are not weighted, but the risk increases with each pound you add. Use them as a progression to full dips and leave them after. Just like pause bench, pause dips are used to increase strength at the bottom. They are harder because they eliminate the stretch reflex, explained here by Dr Michael Yessis at EliteFTS.com. If you find yourself failing reps at the bottom, use this variation for a few weeks. The logical progression after mastering the basic dip form. (Almost) infinitely scalable, you can use them in your training for years and years. They offer the same as the regular dip, just more of it – and the more weight you use, the stronger you will get and the bigger your muscles will grow. Even if you want to progress to different progression, you should keep weighted dips in your program, as they will directly make you better at advanced variations, like the Russian or Korean dips. For example, if you do 5 total sets of dips in your workout, do at least two of them weighed and the rest choose a progression you want to work on. Pretty self-explanatory, single bar dips are done on a single bar. Some people find them harder and some easier due to the slightly different activation. There are two variations depending on which grip you use: overhand (like a pull-up) and underhand (like a chin-up). The underhand variation is much harder and worth progressing to. The ultimate dip to develop your triceps. Russian dips are done by lowering to an upper arm support, which makes them much harder, especially on the triceps. You should be able to do 10 regular dips before you begin to train for this variation. The stronger you are, the easier it will be to master it, so weighted dips are recommended. A muscle you might want to train separately for this exercise are your triceps. Including a few sets of tricep extensions, either with a barbell or dumbbells, will both strengthen that part and prehab it for the stress it will be put under. If you want to make this exercise even harder, do it with your legs in an L-sit position. Another funny name that makes you wonder how it came to be (they’re named after coaches from different countries), but a very hard exercise nonetheless. Korean dips start with you sitting on a single bar and basically swinging down and back with the strength of your arms, chest and shoulders. Besides the significant strength requirement, it also demands skill to maintain proper rhythm. They can also be done with an overhand or underhand grip, with the undergrip version again being the harder one. Ahh, the rings, the tools so many gymnasts have used to develop awe-inspiring upper bodies. 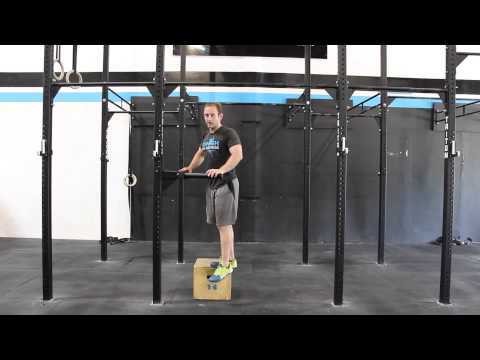 Ring dips add an element of instability to the movement and are a prerequisite for ring muscle-ups. A word of warning: they are much harder on the connective tissue of the chest than dips on parallel bars. You should be able to do most previous variations and regular dips with a good bit of weight before including these in your training regularly. An advanced variation of ring dips is the Bulgarian ring dip pictures in the video above. In this version, the arms go straight to the side. It is a much harder variation and one of the preparatory elements for the Iron Cross. An easy way to eke out more muscle gains from the regular dip is to manipulate the speed at which the movement is done. By doing them as fast as possible you will be activating more fast-twitch muscle fibers, which can lead to additional hypertrophy if you have been doing primarily slow work. They also put more stress on the muscle at the bottom of the movement due to the increased force, which again carries the potential for more muscle and strength gains. However, it should be clear that you should already be doing weighted dips to be prepared for and to receive all the benefits of speed training. Swinging dips are explosive dips taken a few notches higher. They are the ultimate plyometric variation and will build explosive strength like nothing else. This is the variation you want to get to if you’re doing any kind of sports where you need to be explosive with your upper body, like martial arts. Dips are an amazing exercise – one of the best ones you can do at home without a doubt. If you are currently preparing for that beach body, you should be including them in your workout. If you do, you will see enviable gains in your arms, chest, and shoulders that will drive fear into your enemies and make women blush as they look at you (well, maybe not all of that). Takeaway: if you aren’t dipping yet, start now!